Following are five affidavits submitted to the newspapers by Colonel Thomas B. Felder, of Atlanta, for publication with his statement answering the dictograph quotations. First appears the affidavit of C. W. Tobie, representative of the Burns detective agency investigating the murder of Mary Phagan. Second is that of W. A. Milner, an attorney of Cartersville. Third, comes that of W. D. Rhea, formerly of Nashville. Fourth, is the deposition of C. R. Atchison, formerly of Nashville. And fifth, comes the affidavit of E. W. McNeal, formerly of Nashville. “Personally appeared before the undersigned, an officer authorized by law to administer oaths, C. W. Tobie, who, first being duly sworn, deposes and says. That he is a citizen of Chicago, with offices in the First National Bank building of that city and that he is manager of the criminal department, west, of the William J. Burns National Detective Agency; that he has occupied this position for the past ten months; that he has been connected with the William J. Burns National Detective agency, as manager of the Kansas City, Missouri, branch office, since May, 1910; that for a year prior to that time he was connected with the Tilletson Detective agency, correspondents of the William J. Burns National Detective agency; that prior to that time deponent was connected with the Pinkerton National Detective agency for a period of nine (9) years; that he severed his connection with the Pinkerton National Detective agency in May, 1909. “Deponent says on oath that the statement that he was discharged by said agency is utterly, absolutely and deliberately false; that he resigned from said agency, and not under compulsion, but of his own volition. “Deponent further says on oath that about two weeks ago he was instructed by Raymond J. Burns, the secretary and treasurer of the William J. Burns National Detective agency, who was acting under instructions from his father, to come to Atlanta on a murder case and report to Colonel Felder. Arriving in Atlanta, he had a conference with Colonel Felder, and immediately entered upon the work at hand. Later he had a lengthy conference with Colonel Felder and Hon. Hugh M. Dorsey. “Deponent further says on oath that for the past ten days he has been diligently at work in an effort to unearth the Phagan murderer or murderers; that during this time no hint, suggestion or proposition has been made to him by either Jew or Gentile, man, woman or child, to work in the interest of Frank, or any other suspect; that during this period he has acted conscientiously, faithfully and diligently in an effort to ferret out the mystery and place the crime upon the shoulders of the guilty party. At no time has deponent ever been requested, required or instructed to investigate the police or the detective department, or in short, to perform any other duty in connection with his stay in Atlanta except the duty which brought him to this city; namely, the investigation of the Mary Phagan case. “Deponent further says on oath that the statement imputed by an afternoon paper to Colyar to the effect that I informed him at the Piedmont hotel that I was going to Colonel Felder’s office “to meet a committee of citizens, among whom were Mr. Hirsch, Mr. Meyer and Mr. Greenstein, and several other prominent Jews in the city” is a deliberate, malicious and willful falsehood. As a matter of fact, I never heard of either one of these gentlemen until I read their name in the papers on yesterday afternoon, and I have never met them or either of them at Colonel Felder’s office, or elsewhere, and deponent firmly believes that this statement is made as a part of a well-planned conspiracy to discredit his efforts, and the efforts of Colonel Felder, to unearth the Phagan murderer or murderers. “Deponent further said on oath that he never laid eyes on Colyar in his life until he met him at the office of Col. T. B. Felder on Sunday evening, May 18. At the time of deponent’s arrival at said office, the conference between Colyar and Colonel Felder, which had evidently been brief, was drawing to a close, and at Colyar’s invitation, I made an ap[p]ointment to meet him at the Piedmont hotel on the following morning, as he stated that he had very important information in connection with the Phagan case, which he desired to impart to deponent. After meeting at the Piedmont hotel, the said Colyar stated to deponent that he had a number of affidavits involving the chief of police and chief of detectives which he desired to submit to him; that he was not here on that mission, and declined to examine the affidavits, whereupon the said Colyar stated to said deponent that the city police and detective departments were undertaking to discredit Colonel Felder’s, Solicitor General Dorsey’s and deponent’s efforts, and added that deponent had three things to fight, to wit: jealousy, politics and money, and repeated it by saying, “Remember now, you are up against J. P. & N.” Deponent reached the conclusion almost instantly that this man was a crook and humbug, and thereupon ended the interview abruptly, and although he has received numerous telephonic communications from him since, he has declined to meet him at his hotel or elsewhere in the city of Atlanta. “Deponent further says on oath that he is advised and believes that in his diligent efforts to unravel the Phagan mystery he has been obstructed by some secret agency at every “turn of the road.” In his efforts to interview witnesses he has found them reluctant to answer questions and to give him necessary information, with the result that deponent reached the conclusion that said witnesses were acting under instructions in their conduct. “Deponent further says on oath that there is nothing in the Phagan mystery different to other mysteries, and that with the co-operation of the agencies that should be in sympathy with the efforts of the William J. Burns National Detective Agency, guilt should be fastened upon the real criminal by absolute and conclusive evidence. “Sworn to and subscribed before as this 24th day of May, 1913. “In person before me the undersigned attesting officer, authorized under the laws of said state to administer oaths, appeared W. A. Milner, who first being duly sworn deposes and says: That he is a practicing attorney in Cartersville, Bartow county, Georgia, and that he knows A. S. Colyar and his general reputation, and that said Colyar’s reputation is known by the good people of Bartow county; that said Colyar’s criminal record is known by the people in Cartersville and Bartow County, and that said reputation is bad and that said Colyar is unworthy of belief; that scores of people Bartow County will testify that they would not believe said Colyar on oath, nor would deponent believe said Colyar on oath. Deponent further says that said Colyar arose in a religious meeting on one occasion and confessed that he was an ex-convict, so he has been informed, and that his record was criminal and that he wished to reform; deponent further says that said Colyar married a lady in Cartersville, and that he bears an unsavory reputation in Bartow county, and that said Colyar could not be believed on oath. “This 24th day of May, 1913. “STATE OF GEORGIA, COUNTY OF FULTON. “Personally appeared before the undersigned officer, authorized by law to administer oaths, W. D. Rhea, who first being duly sworn, deposes and says: That he was formerly a resident in the city of Nashville, and lived there until 1897, and subsequently the deponent resided there from 1902 to 1910, when he removed to the city of Atlanta, where he has resided since at 308 Ponce de Leon avenue, and now at the Georgian Terrace. 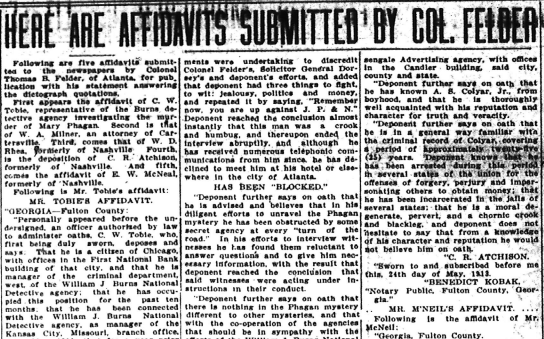 Deponent further says, on oath, that he has known A. S. Colyar for thirty years, during a portion of this time he lived as next door neighbor to him at Nashville, and that he is thoroughly well acquainted with his reputation, honesty, character and veracity. Deponent further says, on oath, that he is in a general way acquainted with the criminal record of this man Colyar, covering the period of his acquaintance with him; that he has from time to time ben arrested for divers and sundry crimes such as forgery, blackmail, fraud, and that he has operated in a number of the states in the Union and has been incarcerated in the jails of many of them; that he is looked upon as a notorious crook where he is known, and deponent does not hesitate to say that, from his knowledge of his character and reputation, he would not believe him on his oath. “Sworn to and subscribed to before me this 24th day of May, 1913. “Personally appeared before the undersigned, an officer authorized by law to administer oaths, C. R. Atchison, who, first being duly sworn, deposes and says: That he was born and reared in the city of Nashville, Tenn., and lived there until January 1, 1913, when he removed to the city of Atlanta, state and county aforesaid, and since that date has been a citizen thereof. “Deponent further says that he resides at the Georgian Terrace in said city, and is vice president of the Masengale Advertising agency, with offices in the Candler building, said city, county and state. “Deponent further says on oath that he has known A. S. Colyar, Jr., from boyhood, and that he is thoroughly well acquainted with his reputation and character for truth and veracity. “Deponent further says on oath that he is in a general way familiar with the criminal record of Colyar, covering a period of approximately twenty-five (25) years. Deponent knows that he has been arrested during this period in several states of the union for the offenses of forgery, perjury and impersonating others to obtain money; that he has been incarcerated in the jails of several states; that he is a moral degenerate, pervert, and a chornic [sic] crook and blackleg, and deponent does not hesitate to say that from a knowledge of his character and reputation he would not believe him on oath. “Sworn to and subscribed before me this, 24th day of May, 1913. “Personally appeared before the undersigned, an officer authorized by law to administer oaths, E. W. McNeil, who first being duly and legally sworn, deposes and says: That he was a citizen of the city of Nashville, Tenn., from 1887 to 1894; deponent is now a citizen of Atlanta, with office and place of business at 92 South Forsyth street. Deponent says on oath that he is familiar with the character and reputation of A. S. Colyar, Jr. Deponent says on oath that the said Colyar is known as a professional crook, blackleg and adventurer; that he has been charged from time to time with offenses of forgery, perjury, conspiracy, black mail, etc. ; that from time to time he has been incarcerated in the jails from the city of New York to New Orleans. Deponent firmly believes that there is not a crime in the cat[a]logue that he would not willingly and quickly commit for money. On account of his father deponent makes this affidavit with great reluctance, but nevertheless is compelled to make this affidavit, because of the charges made by the said A. S. Colyar, Jr., against one of our best and most reputable citizens of the city of Atlanta. From a knowledge of the character of the said Colyar deponent says without hesitation that he would not believe him on his oath. “Sworn to and subscribed before me this, the 24th day of May, 1913.